Triglav National Park is the largest protected area in Slovenia and covers an area of 838 square kilometers. This alpine wonderland encompasses a huge chunk of the Julian Alps (Julijske Alpe), which is part of the Southern Limestone Alps. The park’s name is derived from the highest mountain in Slovenia, Mount Triglav (2864 m). We hiked five days hut to hut across Triglav National Park, starting at Vršič Pass (close to Kranjska Gora) and ending at Lake Bohinj. Because this is a thru-hike, we relied on public transit to get to the trailhead. See Stages 1 and 5 of this guide for transit details. 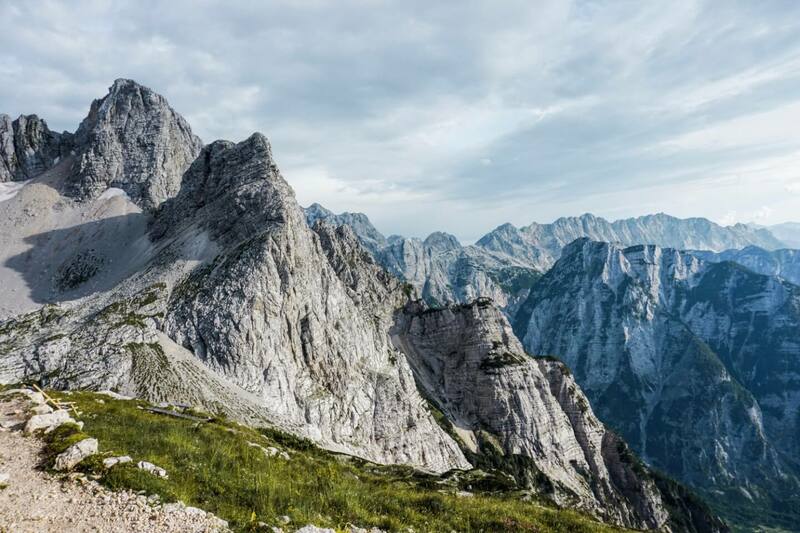 We designed this custom hiking route across Triglav National Park to see the highlights of the Eastern Julian Alps, including the high alpine plateau of Kriških podih, Mount Triglav, the Seven Lakes Valley, Luknja pass and the fairy tale pasture around Planini pri Jezeru. This hut to hut hike was sensational. 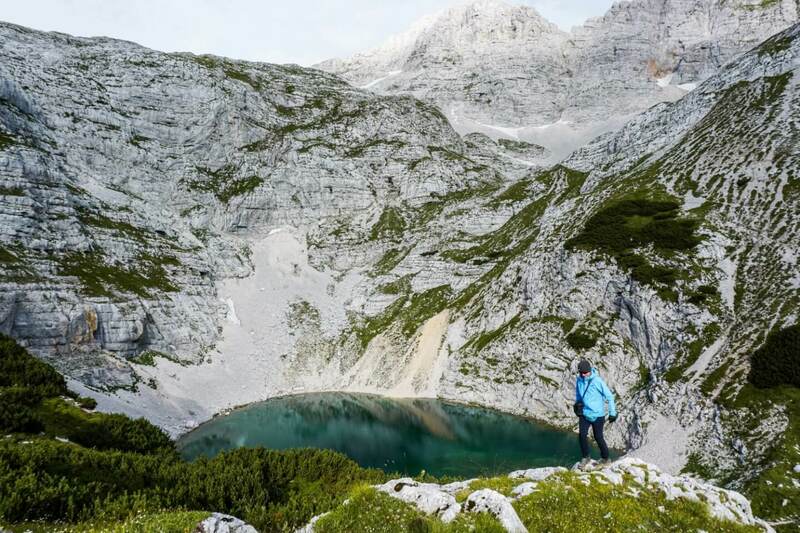 It rewarded us with enchanting views of mountains, edelweiss, ibex and alpine lakes. 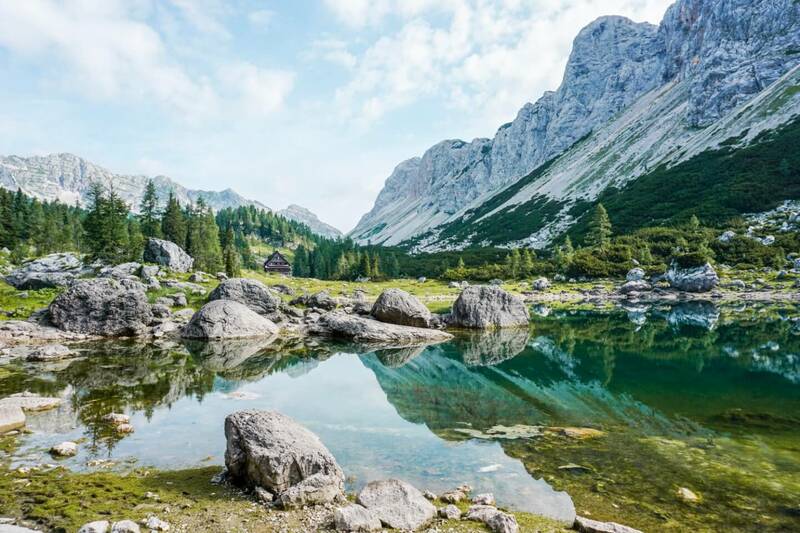 If you are interested in exploring Triglav National Park, but don’t have the time, or inclination, to go on a hut to hut hike, read: 7 amazing hikes in Slovenia, You’ll find several day hiking options in the Julian Alps, including: Seven Lakes Valley and Koča na Planini pri Jezeru. Slemenova Špica is also a popular day hike, which you can read about here (see Stage 1). You can also buy this Cicerone Julian Alps hiking guide. 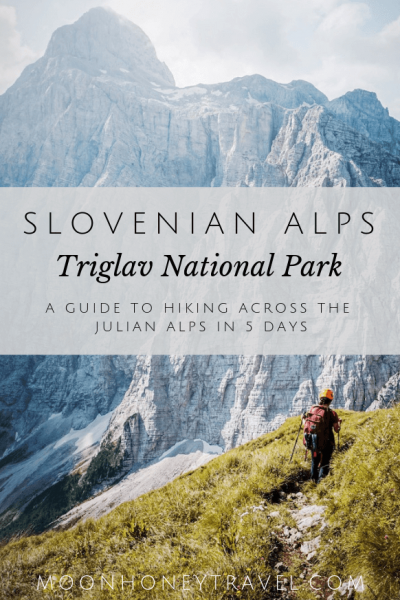 This Triglav National Park hiking guide outlines each stage of our trek across the Julian Alps. It was a challenging hike, but definitely manageable, and significantly easier than our multi-day hike across the Kamnik-Savinja Alps. We’ve also included tips on how to save money, what to pack, and where to stay. Triglav National Park is located in north-western Slovenia. The park territory corresponds with the Eastern Julian Alps and neighbors north-eastern Italy. The park is accessible from Kranjska Gora, Trenta, Soča, Bovec, Ukanc, Stara Fužina, and many other towns. The highest peak in the park is Mount Triglav, 2864 m.
It’s important to make reservations for overnight stays at least 1-2 weeks in advance. Note: if you’re staying in a mountain hut during the weekend, you should book earlier. The most reliable way to make reservations is by calling the hut directly. Email response rate is 50%. You can choose between sleeping in a shared-dormitory, or a private room. If you don’t have a Alpine Club membership, you can apply for the Alpine Association of Slovenia. Processing may take a few weeks. We’re members of the Österreichischen Alpenverein (Austrian Alpine Club), and so we receive discounts on all mountain huts that have contracts with the Austrian Alpine Club. We received a discount in every hut in Slovenia. When planning a trek through the Slovenian Alps, a hiking map is essential. Via Ferrata trails are typically denoted by dotted lines. Routes that are difficult are denoted in broken lines. 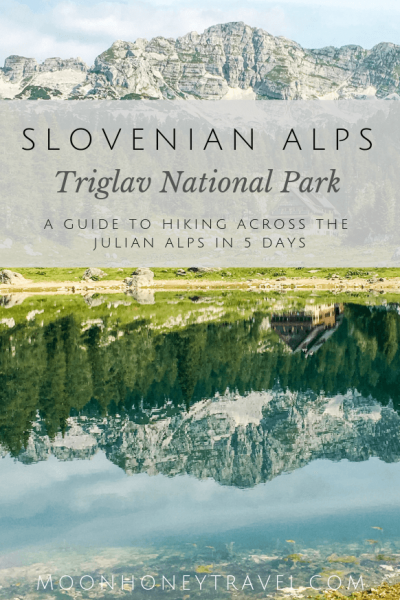 We recommend Sidarta’s Triglav 1:25 000 Map for this specific trek in the Julian Alps. Note: budget an additional 15 EUR per day if you don’t have an alpine club membership card. Dormitory Mattress: ~11.70 – 18.20 EUR. With Alpine Club Discount: 9-14 EUR per person. Private room (2-bedroom): ~14.30 – 24.50 EUR. With Alpine Club Discount: 11 – 18.90 EUR per person. All trails are marked with the Knafelc Waymark, which is a red circle with a white center. Trail markings are generally well-maintained and easy to follow. Stage 1 of this trek is optional. Because stage 2 requires an early start, we decided to sleep at the mountain hut Poštarski dom na Vršiču, which is located directly on the trail. It was nice to have a leisurely first day. It’s also significantly cheaper to stay in a mountain hut, as opposed to a hostel or hotel. If you’re looking for a place to stay in Kranjska Gora, we had a good experience at Youth Hostel Nika (excellent breakfast). There’s a bus that departs several times a day from Kranjska Gora to Vršič Pass. The same bus continues to Trenta and Soča Valley. 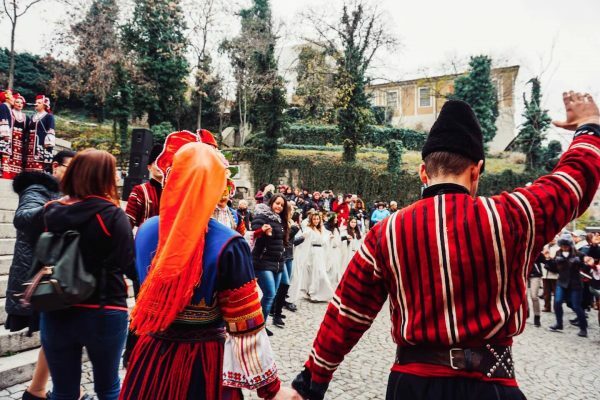 Use the AlpeTour website to find out what the bus schedule is. As of 2018, a one-way ticket to the pass costs 3 EUR. The road to Vršič Pass is known as the Russian Road (Ruska cesta), because it was built by Russian prisoners of war during the first World War. Before settling into the mountain hut for the night, we decided to do a small hike to the lookout-point Slemenova Špica. The trail to Slemenova Špica is located at the pass. To find the trail, you may need to follow the footpath parallel to the road in the direction of Kranjska Gora for 1 minute. You’ll see a red signpost indicating the trail to Sleme (Slemenova Špica). 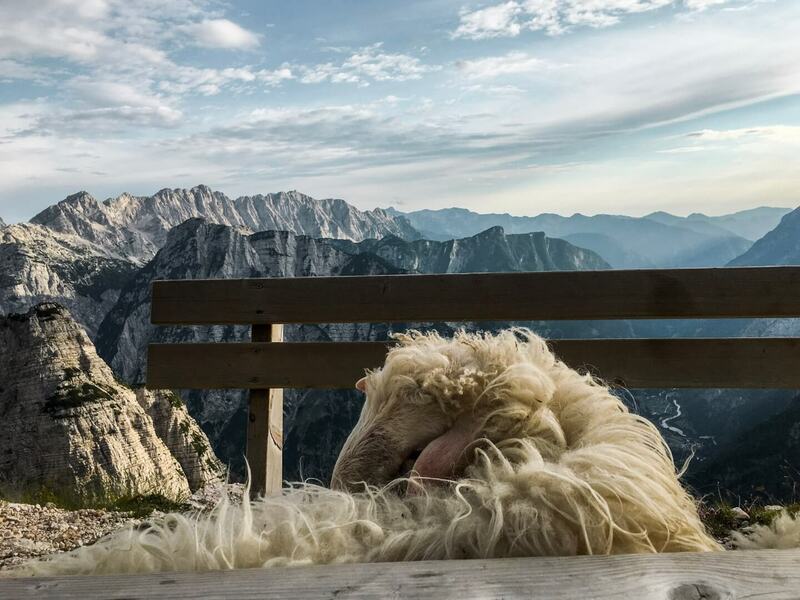 Slemenova Špica is a grassy hill set amidst the dramatic Julian Alps. It’s a popular day hike destination suitable for families, so you’ll see more people on this trail than the other stages of this trek. It takes 1.5 hours to reach Slemenova Špica. After 30 minutes, you’ll reach the saddle Vratica (1799 m), where the trail splits. To hike to Sleme, you’ll go right (45 minutes). The hike to Mount Mojstrovka along the Hanzova pot (2 hours) steers left. After another ~ 30 minutes, you’ll reach a junction. You’ll see a path to the right signed Grlo that heads to the Tamar mountain hut. Stay to the left. Keep your eyes peeled for another trail intersection. You’ll want to head right. If you continue on the main trail, you’ll end up at the Slatnica saddle. After a few minutes, you’ll reach the grassy meadow of Slemenova Špic. With mountain views in every direction, this lovely hill is ideal for a picnic and snooze. To return to Vršič Pass, follow the same trail back. 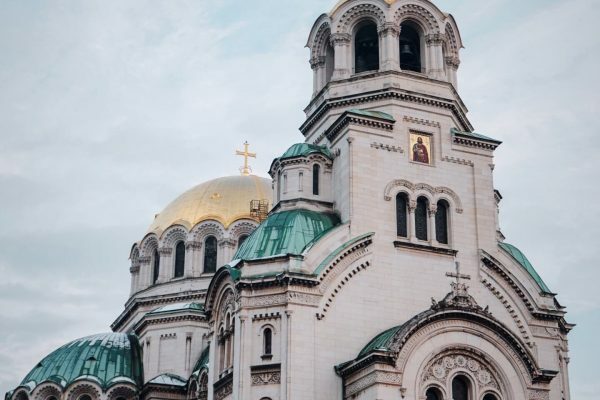 Once you reach the pass, cross the street and walk towards the hut Tičarjev dom. From Tičarjev lodge, follow the gravel road for 10 minutes to Poštarski dom na Vršiču. Showers available: 4 EUR for 4 minutes (take advantage of it). Private and shared rooms available. Outdoor and indoor dining areas. The hike today follows the Slovenian Mountain Trail (marked with the number 1). There are several ways to reach today’s destination, Kriških podih. We opted for the easiest route, which circumvented Mount Prisank. 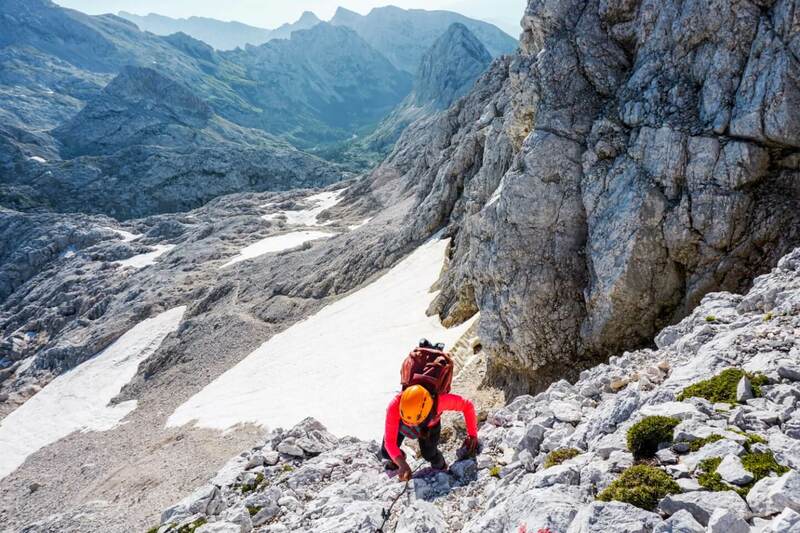 If you’re a confident alpine hiker with lots of via ferrata experience, you could hike up and over Prisank on your way to sedlo Planja. We recommend consulting a hiking map to see what your options are. The hike today takes 6-7 hours. From the mountain hut, head to the Pagan Girl Rock lookout point, marked by an info-board. Here, you’ll find the turn-off to Prisank. After passing through dwarf pine, the first segment of the trail is initially very rocky. At Na Robu, the trail forks. You should head down and right. We somehow missed the trail and continued in the direction of Grintovci. Luckily, there’s a route labeled in red paint “Mlinarica” that connects to the trail we should have been on. However, it’s really easy to miss, as the trail marker is close to the ground. This trail is very poorly maintained and hard to follow. So, don’t miss the turn-off around Na robu like us. The trail follows just above, or just below the bushline for a long time. Eventually, you’ll reach a grassy open meadow framed by peaks. Take a break here. The trail traverses the meadow and then steadily climbs. You’ll reach an intersection, where the trail leads left to Prisank and right to Razor. Head towards Razor. The climb to Sedlo Planja, the mountain saddle between Razor and Planja, is challenging. We got caught in a thunderstorm as we were approaching the pass, which made this segment more difficult. Note: we recommend wearing a helmet for this part of the trail. At the Planja saddle, you can hike to the summit of Razor and/or Planja. Or, you can simply enjoy your first glimpse of Mount Triglav and start the descent to Kriških podih. The trail is assisted by some steel cables and ropes. Be extra careful on the descent, because you’ll be hiking down scree and loose rocky terrain. After about 1-1.5 hours, the trail finally flattens out. As we hiked towards the Pogačnikov dom na Kriških podih, we saw two amazing things. 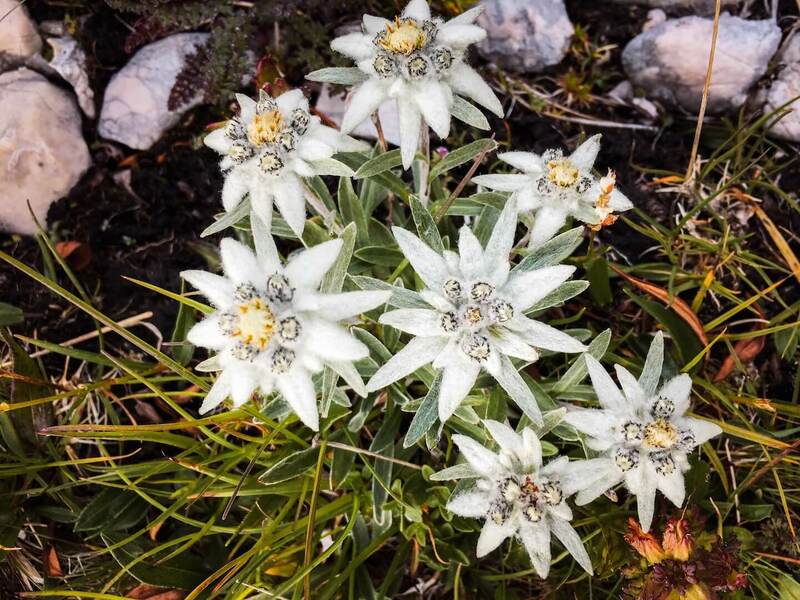 First, we saw an ibex, and then the most beloved flower of the Alps, Edelweiss. The trail makes a final ascent to the mountain hut. 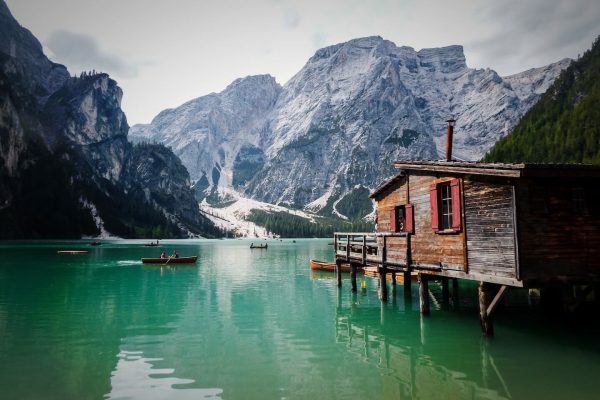 This hut is positioned high above the Trenta Valley and surrounded by peaks and three alpine lakes. There’s nothing like lounging in a chair outside this hut with a Radler. As we soaked up the late afternoon sun, a few sheep visited us and used our table to scratch their backs (see photo below). From the hut, you can take a short hike to the lake: Sp. Kriško jezero (1880 m). To reach the lake, take the trail in the direction of Trenta. Pogačnikov dom only offers shared rooms. The prices vary based on how many people are in your room. If you sleep in the dormitory-loft (cabine), you’ll pay 9 EUR (with discount). If you sleep in a 4-bed-room, you’ll pay ~18 EUR (with discount). Day 3 is phenomenal. 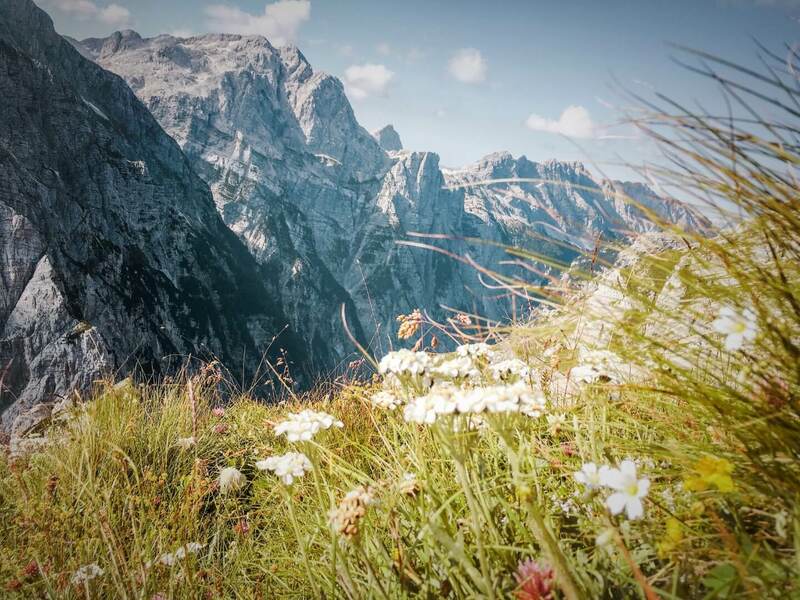 After climbing over the mountain Bovški Gamsovec, you’re met with heart-melting views of Triglav. In July, the trail was surrounded by color. There were so many wildflowers to admire, it was hard to keep a consistent pace. Stage 3 takes 6 hours. 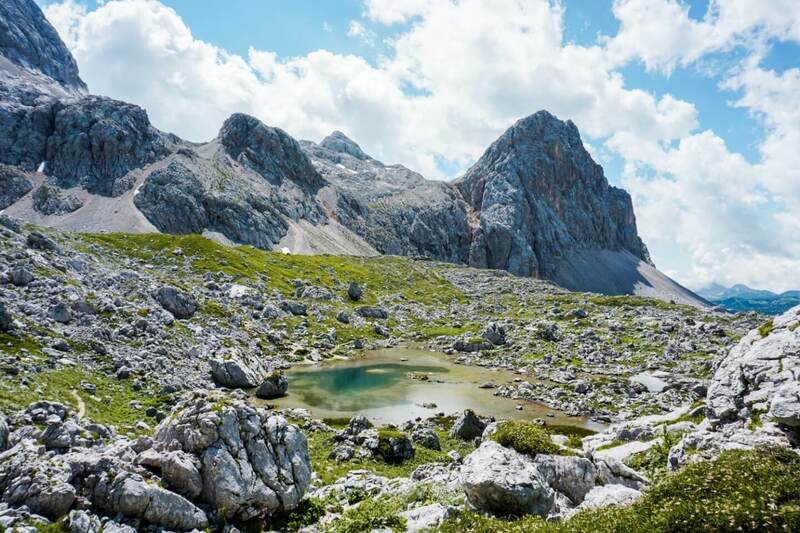 The hike begins gently, crosses slabs of limestone and ascends to the mountain Bovški Gamsovec. It takes about 1 hour to reach the Bovški Gamsovec ridge. There are assisted ropes and cables to aid your ascent. To reach the summit, you can take a short detour via a protected climbing route. Otherwise, the path continues over the ridge. 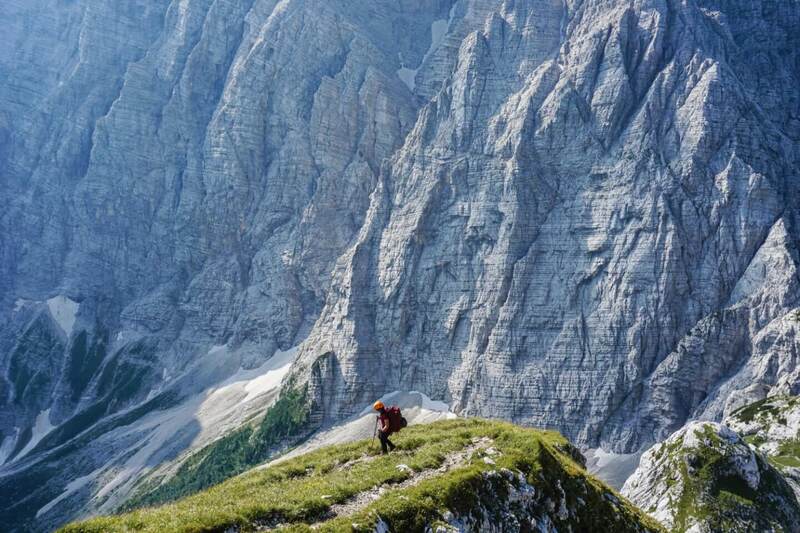 Here, you’ll see the incredible northern wall of Triglav. The descent is gentle as you hike through beautiful wildflowers and grassy slopes. You’re heading to the mountain pass Luknja. We saw ibex on this part of the trail. 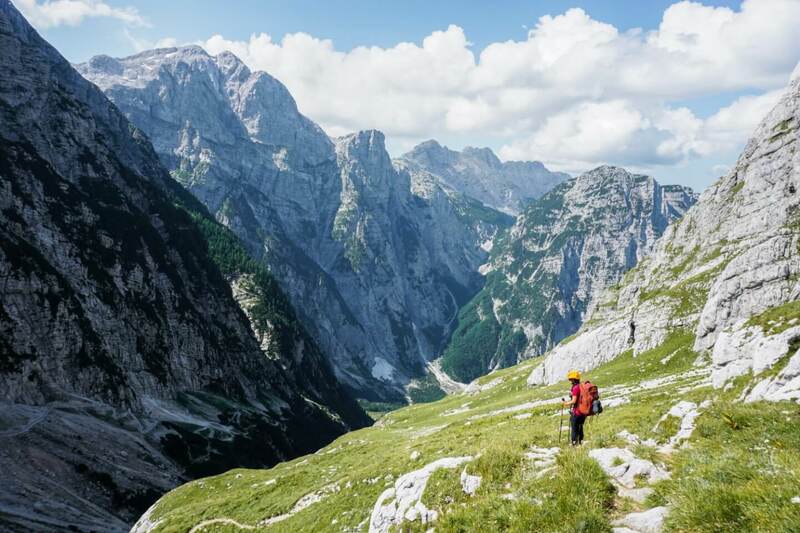 As you near Luknja, you might see people climbing up to Triglav via the Plemenice trail. It’s impressive! 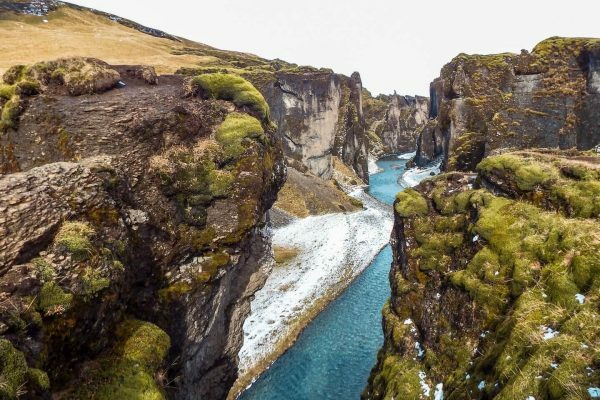 At Luknja, you’ll go right and hike down a windy path. The trail eventually divides and you’ll want to take the trail to the left along pod steno. This part of the hike is uphill, but very easy. You’ll have sweeping valley views to your right. The trail then flattens out for a while. The final stretch is another ascent to the mountain hut Koča na Doliču. 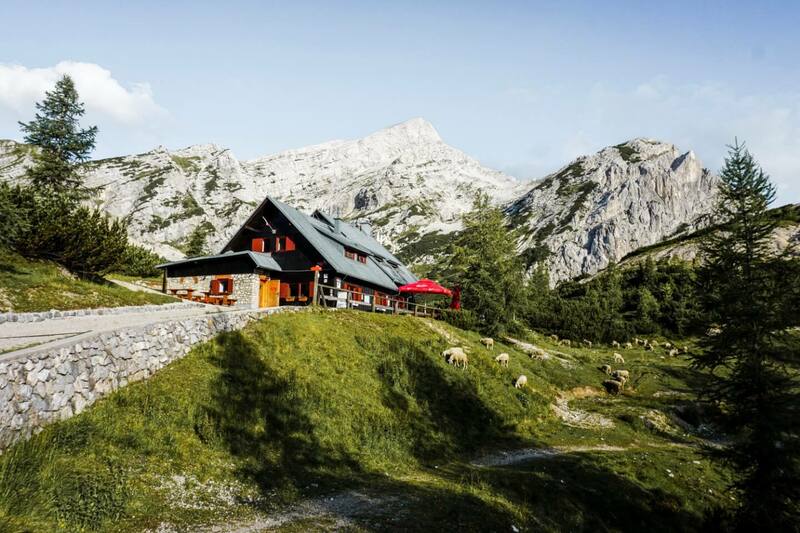 This mountain hut is popular, due to its proximity to Triglav. Most of the hikers we met, were planning on summiting Triglav the next morning – which might be something you want to do. If so, you definitely need to bring a via ferrata kit as well as light backpack to carry water and snacks. All the hikers left their heavy trekking packs at the hut and retrieved their stuff after their Triglav hike. This hut has a great location, but there are some downsides. There’s no running water. The toilet facilities are pretty gross (squat toilet). You can only check in at 4:00 p.m., or later. If you arrive after 5:00 p.m., you need to notify them before. The food was okay, but the portions were meager. And, if you opt for their half-board rate (which includes breakfast and dinner), the breakfast includes white coffee, which is a wheat-based coffee with milk, not real coffee. If you want real coffee, you have to pay more. Other than that, it was clean and comfortable. 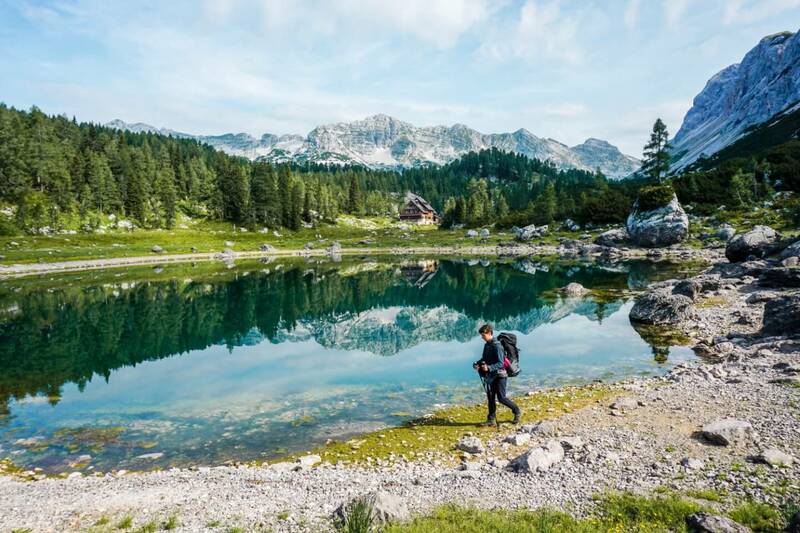 Today, you’ll venture into the Seven Lakes Valley, one of Slovenia’s most beautiful landscapes. The hike begins with summiting a mountain. 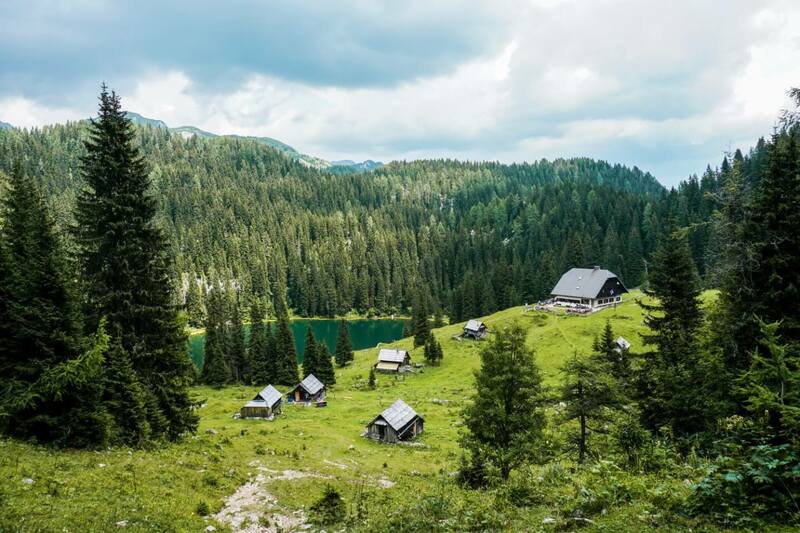 You’ll have an opportunity to take a break at the perfectly situated mountain hut Zasavska koča na Prehodavcih, before starting the slow descent through the lake-dotted valley. We hiked to Seven Lakes Valley via the mountain Kanjavec. If you’re looking at a map, you’ll notice that there are at least two other options. According to the hut staff at Koča na Doliču, the trail via Skozi rizo shouldn’t even be on the map, as it’s not a secure, or safe route. The other option is to go via Dolič (2164 m) and Hribarice (2358 m), which is the most popular route (and perhaps the best route). The hike to the Kanjavec summit takes about 1.5 hours. The trail is very manageable. However, there’s a 5 meter via ferrata (klettersteig) section shortly before the summit, which was challenging. 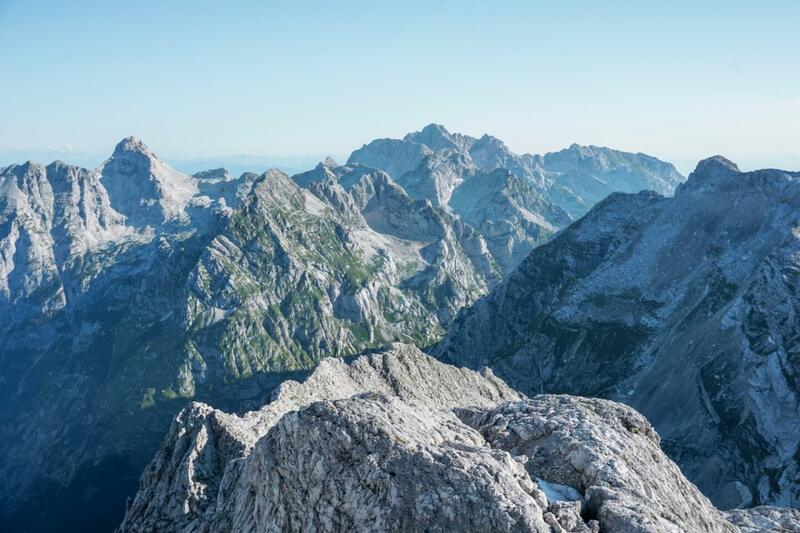 As you ascend, you’ll see Triglav bathed in the morning light. You’ surrounded by limestone mountains and it’s a treat to hike up here in the morning. You’ll likely have the whole mountain all to yourself. After reaching the summit, the trail dives down over scree slopes. It feels really desolate on this side. When we hiked here in summer 2018, the trail markings were fading. We needed to use Maps.me to make sure we were going the right way. This rocky terrain carried on until Zasavska koča na Prehodavcih. We took a detour to visit this mountain hut, because we had sufficient time and wanted to rest. On the way to the hut, you’ll see the lake Rjavo jezero (2006 m). To get back on the trail towards Koča pri Triglavskih jezerih (Seven Lakes Valley Lodge), simply follow the signs. The path is well-marked. The first gem you’ll pass is Zeleno jezero (1988 m), a emerald-colored lake with limestone boulders and a picturesque backdrop. The second lake you’ll hike by is Veliko jezero Ledvicka (1831 m). 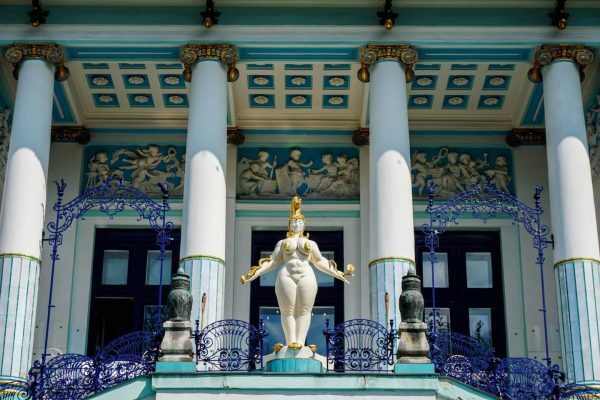 When illuminated by the sun, it glows with beautiful tones of teal and royal blue. As you lose elevation, the plants will be higher and you’ll start to hike through forest. You’ll pass one more lake before reaching the hut. The Seven Lakes Valley Hut is a stunner. Surrounded by crystal-clear lakes, it’s what hiking dreams are made of. One of the most spellbinding sites of this whole trek is seeing the mountains reflected in the waters of Dvojno jezero. The hut has running water and showers. It costs 4 EUR for a 3 minute shower. There are both private rooms and shared bedrooms available. This is a popular destination, so definitely book in advance. 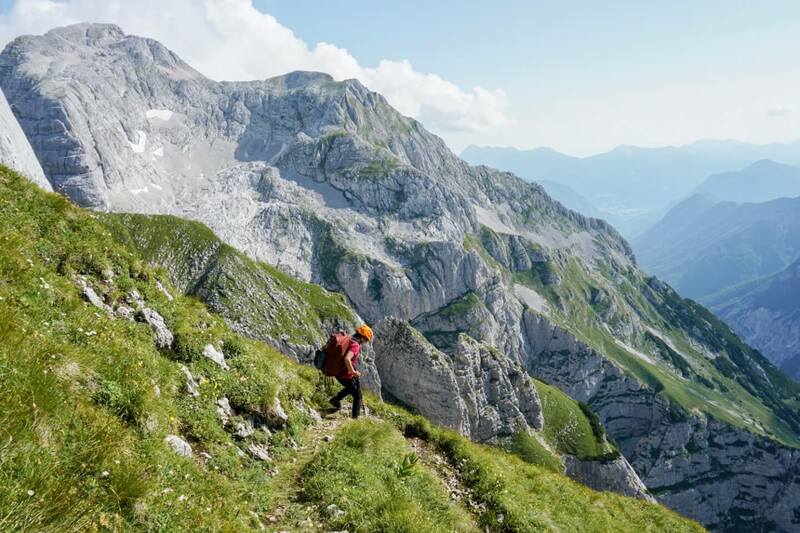 Today, you’ll leave the high mountains and hike through alpine pastures and forests. Days 1 through 4 were filled with dramatic alpine landscapes. Day 5 is full of romantic scenes of rustic huts and grazing dairy cows. From the Seven Lakes Valley Hut, you’ll leave the valley and ascend to the mountain ridge Štapce. After hiking over Štapce, you’ll hike a gentle path through dwarf pines. Follow signs to planini Viševnik. You’ll cross a small alpine pasture with several huts called Ovčarija, before reaching Bregarjevo zavetišče na planini Viševnik (Bregarjevo Shelter on Plateau Viševnik). Bregarjevo used to be a cheese factory. In 1981, the old farm was transformed into the shelter which offers overnight stays. It’s open from early June until the end of September. 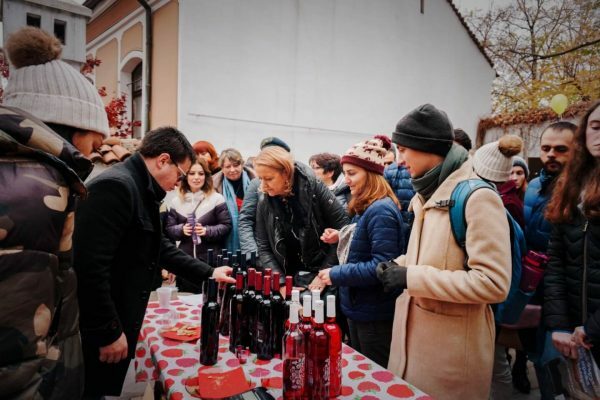 Bregarjevo zavetišče is a charming place to relax and enjoy a refreshment. The trail continues to the mountain hut Koča na Planini pri Jezeru, which is situated above a lake and surrounded by tiny wooden huts. 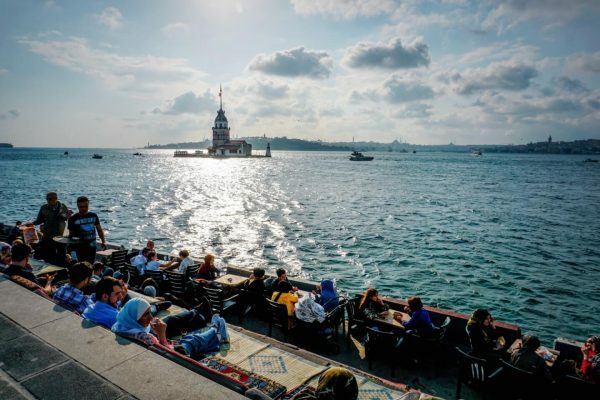 This is an ideal place for lunch. They serve traditional Slovenian stews and soups. From here, follow signs to Planina Vogar, signed 1.5 hours. The trail is wide. After about 70-80 minutes, the trail joins a paved road for about 10 minutes. Follow the paved road until you see signs and a dirt road veering left and leading in the direction of Vogar. You’ll pass by several huts and lodgings before reaching Kosijev dom. 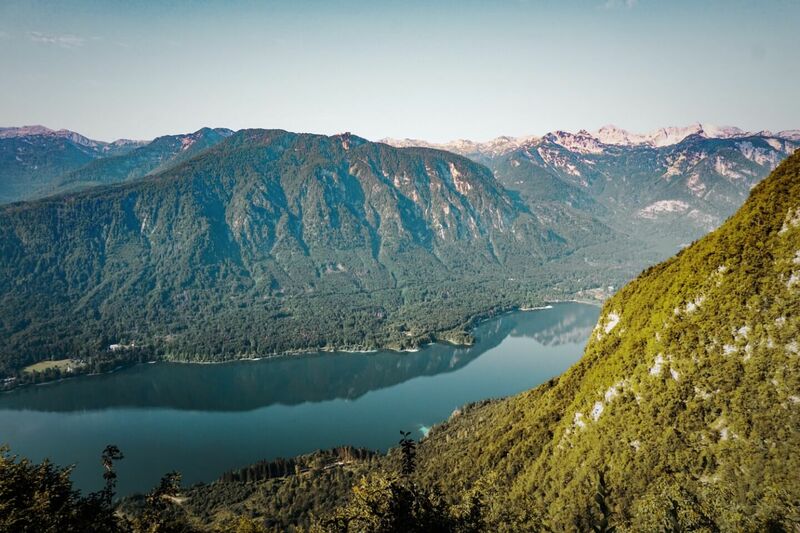 At Kosijev dom, take a short 3 minute detour to a Lake Bohinj lookout point. 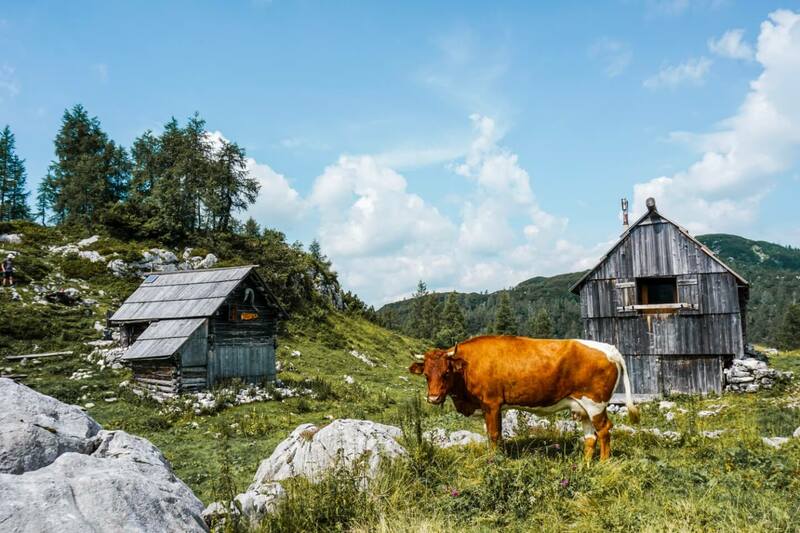 If you’re ready to finish the hike today, you can walk directly to both Stara Fužina, or Ribčev Laz – two villages close to Lake Bohinj. We decided to stay in the mountain hut, Kosijev dom na Vogarj, and hike the final hour to Lake Bohinj the next morning. After enjoying a well-reserved dip in the crystal-clear waters of Bohinj, we ate lunch in Ribčev Laz and took a bus to Ljubljana. Passport. It’s required by law that lodging providers (hotels, guesthouses, mountain huts, etc…) in Slovenia officially register your personal details. You’ll need to present your passport in every hut. Polarized Sunglasses. It’s critical to buy polarized glasses that wrap around your head. The limestone reflects light like snow. Via Ferrata Kit. Helmet, harness and energy absorbing lanyard. Buy full kit here. 2 x 1-Liter Reusable Water Bottle. We both carried 2 water bottles each. You can refill your reusable water bottles at the mountain huts, but there’s no source of water between the huts. Cash. Credit cards are not accepted in all the mountain huts. 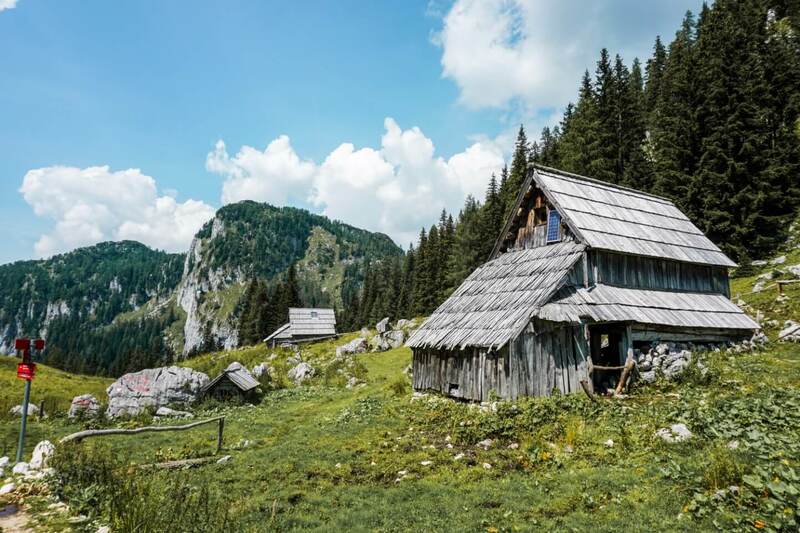 hribi.net: resource for all mountain huts, peaks, connections in Slovenia. The site needs a redesign, but it’s a reliable source of information for all things hiking and mountaineering in the Slovenian Alps. 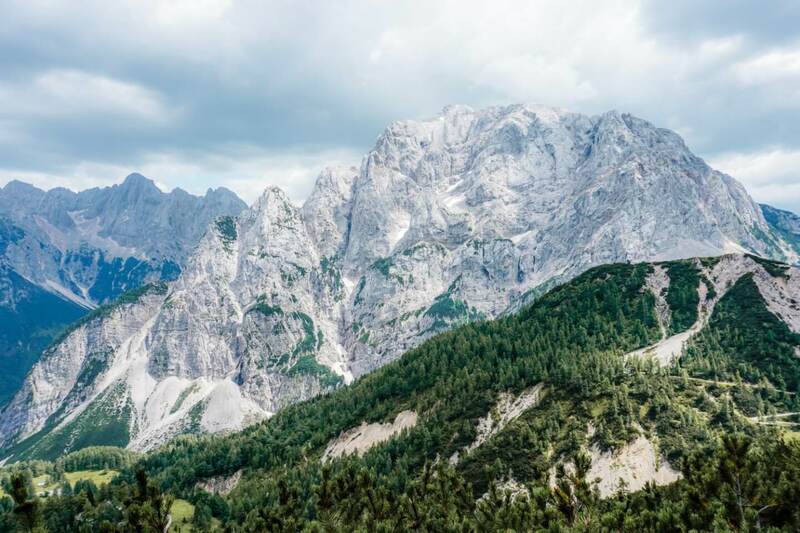 You can find specific destinations and trails in the Julian Alps here. Info on Trail Closures: map indicating what trails are closed is maintained by the Alpine Association of Slovenia. 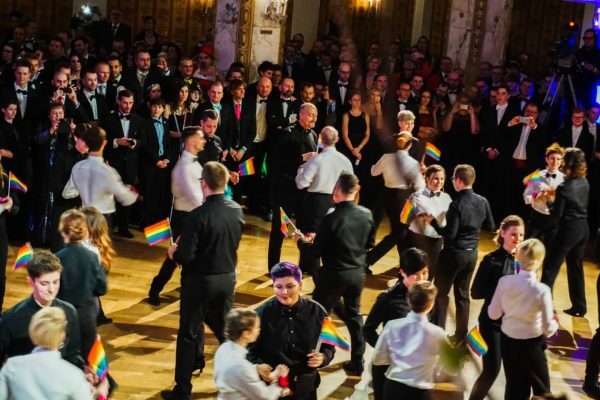 There are some affiliate links in this itinerary. If you make a booking or a purchase using the links, we’ll get a small commission at no extra cost to you. It’s how we cover the costs of running the blog! 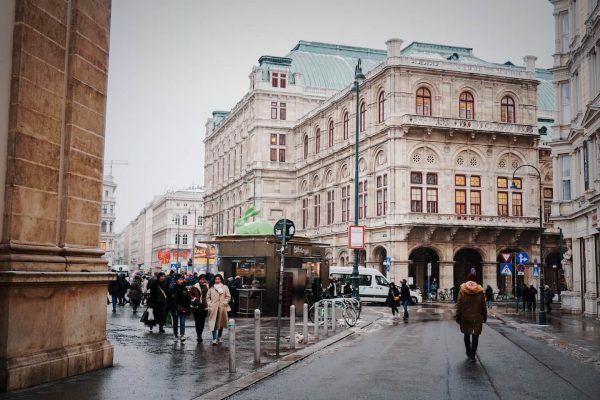 Read our latest posts about Europe Travel.